This year is the 10th-anniversary of the first "serious" release by Mirkwood Recordings, Stands in Lightning's Metanoia. 10 years ago, I was still in high school, and I wasn't going to shows. I never heard this when it came out, but I took a listen to it the other day during a night when I was haunted by fever dreams of chunky drawings of small spacemen wielding enormous pencils. 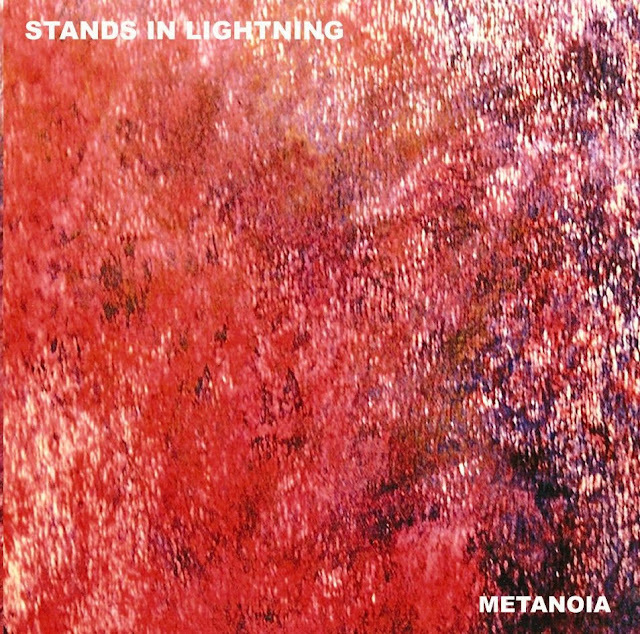 Metanoia starts out with the single-worthy "Wherein Hast Thou Loved Us", a poppy bit of noise rock, reminding me of The Wedding Present's "Brassneck" or Pittsburgh's own Arco Flute Foundation. There are some soaring highs and deep lows on this track. It's a really great opener. "Apples" has chunky riffs, burbly bass, and the sound of classic emo (Rites of Spring or early Weezer). This sound continues for the majority of the album. The two solos on "Apples" remind me of the differences in the solos on "Marquee Moon"; here one is cool/weird/warbly and the latter solo is full of staccato attack. Continuing with the emo sound, "Noli Me Tangere" does it again with the Nirvana loud-quiet-loud dynamics. There is a haunting solo here with imperfections that make the ghost real. "What It Was" is much quieter, J Mascis singing along to the Mountain Goats' folk. The titular "Metanoia", meaning spiritual conversion or the like (I had to look it up!) has some cool guitar lines like the earlier tracks, but it's a lot quieter with a very stoic bass. The song jumps up in the middle, yelling to a fiery solo. It's a strange song, kind of hollow. There's the spiritual awakening for you. There's a bit of a break after "Metanoia". I guess we can call this "side 2", though I doubt that Metanoia had a vinyl release; 2007 is just before The Great Vinyl Resurgence. Anyway, "A Great Burden" sounds totally, tonally different from the others. It opens with a riff like "Werewolves of London" and is more of a rocker. It still has a similar downward feeling though. "Spiders and Heaven" is a great name for a track; it reminds me of a strange idea I had of cosmic spiders that keep the planets together with their interstellar silk. This one has a way different feel again, alt-country or whatever, with a waltzing tromp to the backbeat. It's a very solemn story, set to harmonica, about the afterlife. "One Wasp Left" starts sounding like something from a different album entirely - very, very lo-fi production and much lower in volume. It boosts after 30 seconds into fierce guitars, the tale of work vs love. I really liked this one - there's a lot of energy. The imperfections are kind of cool. The album closes out with "Dietrich Bonhoeffer", a priest turned spy who met his death at the hands of the Nazis. The vocals sound like Thurston Moore, and this track is more rockin' with thrashy guitar and lots of crashing cymbals. Metanoia has great production, with deep bass tones, perky drums, and wailing guitar and vocals. It has a sound that mixes Dinosaur Jr with the emo of Lync or Rites of Spring. Though there are some really strange contrasts at times, many of the tracks are mired in downerville, washing away the mind in a thick paste mudslide. I should also mention that I don't really like the cover art. It's an abstract image, sort of like a bloody explosion. That's fine, but the text seems a bit lazy and the image is very low-res. Despite that sinking feeling, Metanoia is still a Good album; the hope comes through when needed. The songs are good, and the feelings are real. This album feels like a monolith to a time and a place and a feeling and the people that were there; the band's name fits it sharply, as it really would stand amidst falling bolts, collecting them for its own self-worth. I felt shocked myself when the musick stopped.